Management icon. 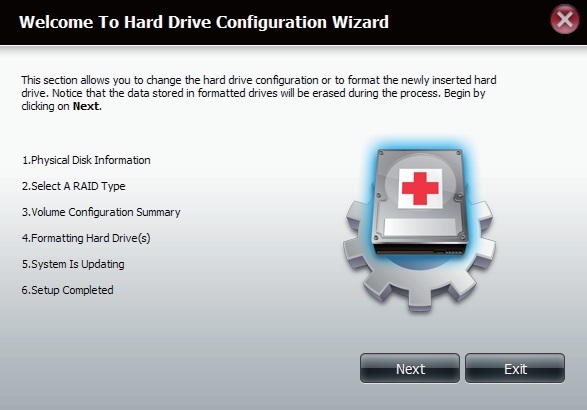 Select the Hard Drive Configuration menu item on the left of the window. This menu will allow you set the RAID type and format your hard drives. 1.Initially the steps of the configuration process are shown. 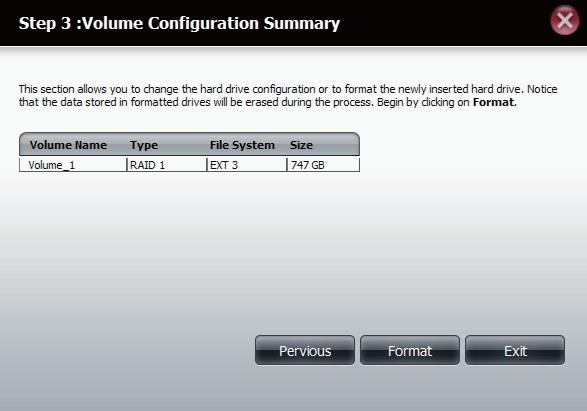 You must decide on the RAID type you would like to format your HDDs with. Click the Next button to continue or click Exit to cancel. 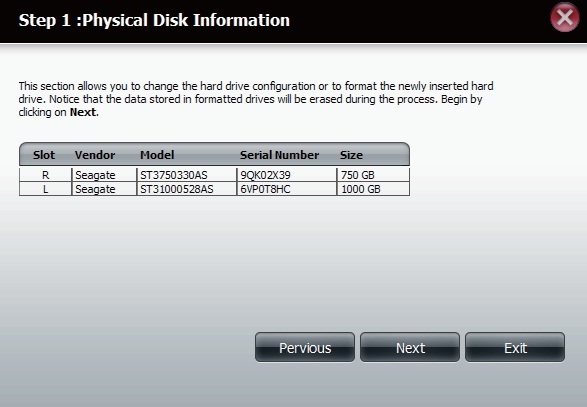 2.This screen displays the currently installed HDD information. Any data on the installed hard drives will be lost by the formatting. Click Next to continue. 3.Select the format desired by clicking on the RAID type box to highlight it in blue. 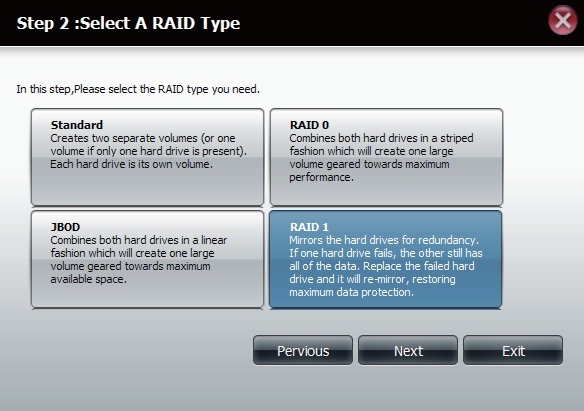 In this example the maximum data protection option of RAID 1 is selected. Click Next to continue. 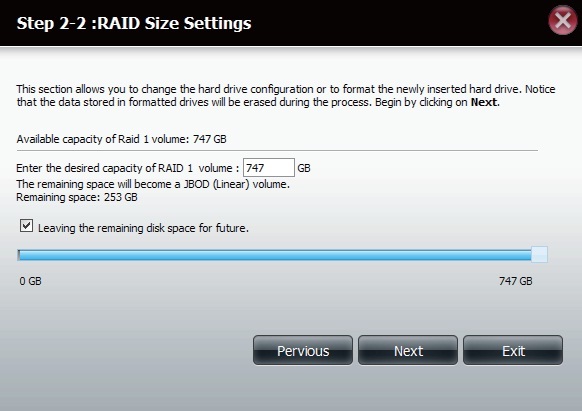 4.If you select a RAID 0 or 1 option then you need to determine the size of the RAID volume. Any extra space will be formatted as a JBOD volume. Click Next to continue. Note: If you select Leaving the remaining disk space for future, you can format the JBOD partition at a later time. 5.A Volume Configuration Summary is displayed. Check the table and click Next to format the drives. Otherwise click the Previous button to make changes to your configuration or click Exit to end the wizard. Does D-Link Storage ShareCenter support Western Digital Advanced Format hard drives? Does D-Link DNS-321 ShareCenter support Western Digital Advanced Format hard drives? How to map a Volume using the Windows Map Network Drive Utility on D-Link DNS-323? When formatting D-Link DNS-323 Storage drives why does it hang at 94%? RAID status shows it is degraded, how do manually rebuild or re-sync RAID on D-Link DNS Serice ShareCenter? to inform the reality however I will definitely come back again.